The recent battle between former WBO Jr. Welterweight world champion Ruslan Provodnikov and former world title challenger John Molina Jr. had the look of a fight that would be action-packed. After all, Provodnikov is known as “The Siberian Rocky” and has carved out a reputation as a fighter who will take on anyone. Molina meanwhile, is also known for his crowd-pleasing style which like Provodnikov, has led to some entertaining fights over the years. Molina however, had suffered some setbacks throughout his career and came into the fight with Provodnikov having lost three of his last five bouts. 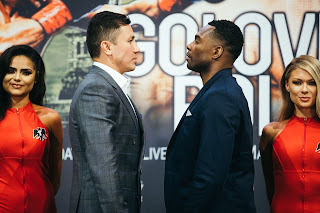 When the two fighters did battle on June 11th at the Turning Stone Resort and Casino in Verona, NY the question that I had in my mind was simply whether or not Molina would be able to deal with the constant pressure style and power of Provodnikov. Although Molina has taken part in more than one slugfest in his career prior to this fight, it had proven to be a difficult task for most fighters who had faced Provodnikov in dealing with his style in that he never takes a backward step and is always dangerous from the beginning to the end of a fight. In thinking of how this fight would be fought, I believed that Molina would have an advantage over Provodnikov in terms of hand speed much in the same way as fighters like Timothy Bradley and Chris Algieri had in their fights against Provodnikov. At the same time, I wondered if Provodnikov were able to land something significant over the course of the fight, whether Molina would break down due to Provodnikov’s relentless attack and pressure. It was certainly no surprise to see both fighters being willing to engage from the outset. Even though this was not an easy fight to score as there were points where both fighters were able to be effective as well as a lot of fighting on the inside, the primary difference in the eyes of this observer was Molina’s ability to get his punches off first, use subtle movement, and be consistent in throwing his jab and straight right hand that gave him the slight edge in what was a very close and entertaining fight from start to finish. Although Provodnikov would have success in getting on the inside of Molina and periodically landing flush hooks with both hands to the head of Molina throughout the fight, he did not have an answer to avoid Molina’s consistent jab and right hand, which were focal points of Molina’s offense in this fight. Despite having his share of success throughout the fight, Provodnikov was unable to nullify Molina’s punch output and that is what ultimately cost him the fight in the eyes of this observer as Molina would win a hard-fought twelve round unanimous decision. It was also not surprising considering how closely fought this fight was round by round to see varying scorecards at the end of the fight. Judge Don Ackerman scored the fight 116-112, or 8-4 in rounds for Molina, while Judges Glenn Feldman and John McKaie turned in scores of 115-113, or 7-5 in rounds and 117-111, or 9-3 in rounds in favor of Molina. In all honesty, this is one of those fights where one could almost expect differing points of view in regard to how the fight was scored. It is important to remember that both fighters did have periods of effectiveness in many of the rounds and there was also a lot of fighting on the inside, which can be difficult to score based not only on judge’s criteria in how they score based on clean punching, effective aggressiveness, ring generalship, and defense, but also where a judge is positioned at ringside, which can result in varying scores. Unofficially, I scored this fight 116-112, or 8-4 in rounds for John Molina Jr. It was clear in my eyes that Molina not only was able to outwork Provodnikov over the course of the fight, but what gave Molina the edge was his ability to be consistent with his jab and land his right hand throughout the entire fight, in my opinion. Although Provodnikov never relented in his pressure of Molina throughout the fight, Molina was always throwing something for Provodnikov to go through before he could not only get on the inside, but get set to throw his punches. There were also periods in this fight specifically in the second half of the fight where Molina was able to make Provodnikov miss periodically with hooks as he came forward. Whether or not that was due to fatigue is something that only Provodnikov could answer, but it nevertheless showed that even though the fight was close, Molina was able to execute his offense a little more effectively. A statistical breakdown of the fight as shown and provided by ThrowdownScoring.com/CompuBox illustrates the effectiveness of Molina throughout the fight as he out landed Provodnikov landing 377 of 1092 total punches thrown to Provodnikov’s 283 of 705 total punches. 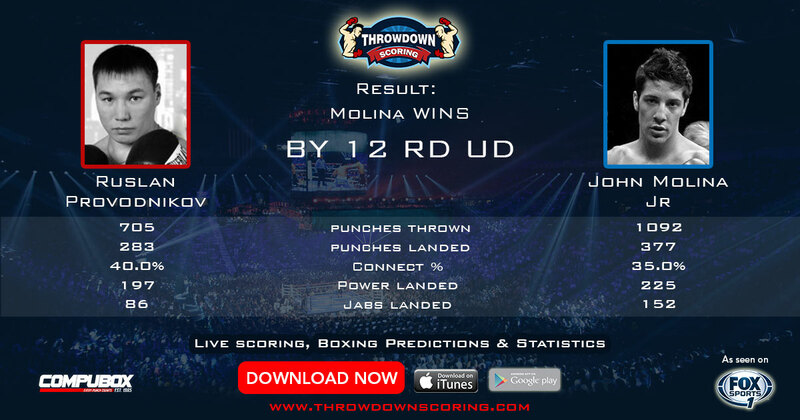 The key statistic shown however, was Molina’s dominate use of his jab out landing Provodnikov 152 to 86. Although Molina only had a total connect percentage of 35% and was not the more accurate of the two fighters as Provodnikov landed 40% of his punches, Molina’s ability to always keep something in front of Provodnikov to go through is what won him this fight as he out threw Provodnikov by 387 punches. As for what is next for both fighters, it would not surprise this observer to see a rematch between the two down the line. As for the immediate future Molina, who entered the fight rated number eight in the world in the World Boxing Organization’s (WBO) Jr. Welterweight ratings would appear to be in a good position coming out of this fight for a potential opportunity to face current WBO world champion Terence Crawford, having defeated Provodnikov, who was rated number two by the WBO going into the fight. This observer believes that Molina could face current number one WBO Jr. Welterweight contender Jason Pagara in the near future with the winner of that potential fight facing the winner of the upcoming WBO/WBC World championship unification bout between Terence Crawford and WBC world champion Viktor Postol, which is scheduled to take place on July 23rd in Las Vegas, NV in a fight to unify two of five world championships in the talent deep 140lb. Jr. Welterweight division. Even though Ruslan Provodnikov did not come out of this fight victorious, he is still very much a factor in the division and it would not surprise me to see him in the discussion for a potential opportunity at a world championship in the future. Although this loss to Molina will likely drop him in the rankings to a degree, Provodnikov is still a crowd-pleasing fighter who will give anyone in the division a tough fight and a fighter who will continue to draw the interest of Boxing fans. It may simply come down to what opportunity may be available to him going forward. Provodnikov-Molina stats and graphic provided by: Throwdown Scoring.com/CompuBox. Used with permission. For more information please visit: www.ThrowdownScoring.com.or www.ThrowdownFantasy.com . You can score live fights by downloading the free Throwdown Scoring app on Google Play or on Apple ITunes. Could Joe Smith Jr. Be In Line For A Title Shot?